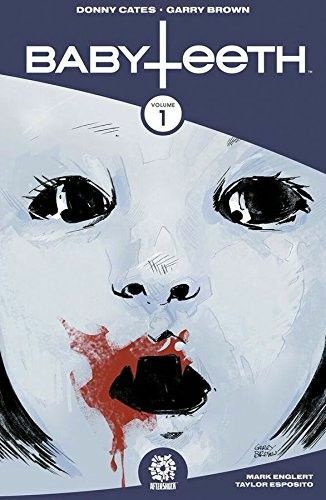 Collecting all five issues of the first story arc from the hit AfterShock series, babyteeth! Sadie Ritter is sixteen years old, nine months pregnant, and scared out of her sweet nerdy mind. Having a baby that young is tough, but with the support of her loving family behind her, everything should be okay. OH YEAH, and also her baby is the antichrist and it's going to break open the barriers between the earthly and demonic planes and unleash eternal suffering to all of humankind. Other than that, though...should be fine. From Donny Cates, writer of Buzzkill, Paybacks, Rednecks and the break-out hit God Country, comes a pulse-pounding new series with art from THE REVISIONIST's Garry Brown!